Burnett 4 Cakes provides high quality cakes made by a professional pastry chef, Chris Burnett. Chris has many years experience in the catering industry. We offer a wide range of cakes and designs at prices to suit your budget. We can make them as simple or as intricate, as light or rich as you wish. Choose anything from a home baked fruitcake to a deliciously moist chocolate orange sponge, perhaps a banana cake or Madeira cake. If this does not tempt you then tell us your favourite flavour and we will endeavour to fulfil your dreams! From glorious cascading wedding cakes to cute character birthday cakes for children, we can produce the perfect cake for every occasion. We can work to your own requirements, from your personal designs, ideas or pictures to provide a unique tailor made cake. Whatever the special occasion you are celebrating, it will be our pleasure to make your cake. 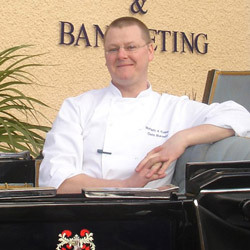 As the Senior Pastry Chef of Headlam Hall Hotel, Gainford, nr Darlington, Chris was responsible for producing homemade desserts and patisseries for literally hundreds of weddings and special occasions over the years. Chris has also had experience of being a part time lecturer in NVQ level 3 Pastry at Derwentside College. “The Art of Chocolate Work” and “The Art of Sugar Boiling” taught by Ildo Nicolello M.C.F.A. Level 3 NVQ Food Preparation and Cooking in Patisserie. City and Guilds 711 Patisserie, Thames Valley, London. City and Guilds Level 3 Patisserie. Advanced Certificate in Food Hygiene. City and Guilds: Training and Development Level 3 – Further and Adult Education Teachers Certificate.